With its excellent ability to nourish and moisturise even the driest of skin, Trilogy Certified Organic Rosehip Oil Light Blend is the natural way to achieve and maintain a healthy, glowing complexion. This totally natural product can even be used on babies. Trilogy Rosehip Oil Light Blend is designed to regulate oil production and improve skin tone. It can also help with reducing fine lines and wrinkles leaving you with a healthy glow. This oil contains oil-regulating properties which makes it an ideal for oily or combination skin. As this oil is lighter than the other rosehip oils in the range makes it ideal for someone who is new to using oils. It feels beautiful and light on the skin yet deeply nourishing. It is packed full of antioxidants which makes it a great choice as a facial oil. Give this oil a try if you are new to facial oils or if you are looking for a lighter consistency for your skin. 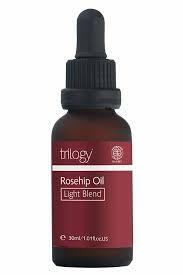 Who can use Trilogy Certified Organic Rosehip Oil Light Blend? Was indecisive as needed something more than moisturizer but I can find some serums too heavy. This is perfect and gentle on the skin (I'm pregnant so mine is a bit sensitive at the moment.) Fast delivery and good price.